The concept of being drawn to the villain is nothing new, and I’m certainly not going to get into why it happens here. You’re not coming to my blog for a crash course in psychology and I am certainly not qualified to be doling out such info. But what I can do is discuss my favorite pop-culture villains. And I figured what better way to do that than to make a top 5 list. I thought about typing a simple list and finishing with an illustration I did, but then I started thinking about the individual villains that I chose, and thought, why not do five different blog posts, highlighting an illustration with each? So, without further ado, here’s number five on my list. For the sake of this list, I’m strictly referring to Vin Diesel‘s character Riddick from the movie Pitch Black. I enjoyed his subsequent films (the animated movie The Chronicles of Riddick: Dark Fury, The Chronicles of Riddick, and Riddick), but none of the sequels came anywhere near the artistic atmosphere of the movie that introduced us to the character. And to be fair, Riddick wasn’t technically a villain so much as a just really bad dude. But for at least part of the film we’re left wondering what his motives are; for part of the film we’re forced to question whether or not he actually is a villainous character. So that’s good enough for me. What is it about him? Don’t know. He’s a violent character, cares about no one but himself, and yet he redeems himself at the end letting us know there’s still some good left in him. Is it the redemption that I’m drawn to? Perhaps. Though not necessarily. Some of the baddies that will follow on my list certainly fail in their redemption. Perhaps it’s his devil-may-care attitude, or moreover, the “I’m badder than the devil” attitude (yes, I know, “badder” isn’t a word–when you’re as bad as Riddick you don’t care about no stinkin’ grammar). Aesthetically speaking, I definitely dug the shiner eyes they gave him (in Pitch Black he indicates that while stuck in a prison where he never saw daylight, he paid a back-alley surgeon to perform a surgical shine-job on his eyes, giving him night vision), along with the steampunk goggles he had to wear during daylight hours. He was resourceful and clearly intelligent, which definitely added to the appeal. He figured out how to deal with the aliens that were attacking the group before anyone else did, and he was the only one who could successfully bypass them and escape the bizarre planet that they’d crash landed on. Should I have said “spoiler alert?” Ah, well. Here’s the illustration. 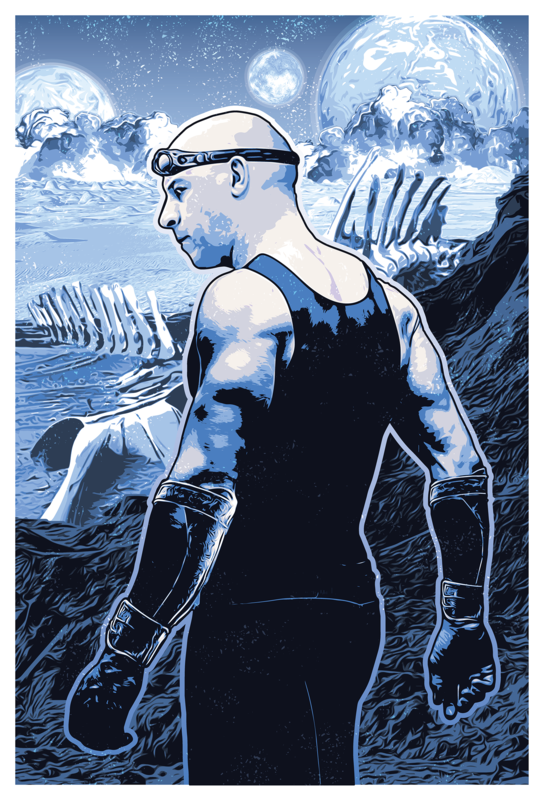 Just a quick note–the landscape, as well as Riddick’s attire, are not necessarily accurate to the movie Pitch Black. I was more going for atmosphere and general feel rather than 100% accuracy.